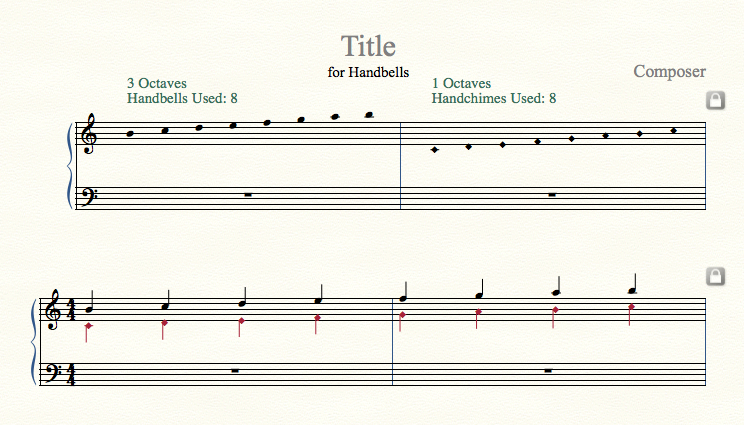 I am using Finale 2014.5 and arrange Handbell and Handchime music for my church Handbell choir. I have a requirement to have both handbells and hamdchimes play at the same time. The notation for hand chimes is the diamond shape for each duration. I can change single notes using the Special Tools ==> Note Shape option. I have two questions: 1) is there a way to change the note heads on a specific layer as a group? ; 2) how can I get the "Handchimes Used" chart to display - the "Handbells Used" chart displays perfectly. First, as a given: I know NOTHING about handbell and/or handchime notation. I started with the Handbell template, and added notes in both layer one and layer two, representing the bells and chimes. Using JW change, I changed the noteheads in layer two to filled diamonds. Next, I used the TG Tools Create Handbells Used Chart. It generated two charts: One for bells, and one for chimes! Now, I'm sure that there are many details that I missed, but it looks like you can do it. This image has been viewed 299 time(s). Mike, Thanks. I'll work with that and see how it comes out. If you have problems, contact me via Private Message, and we'll see if we can work it out! As far as using JW Change, it takes a bit longer if you have half notes and whole notes, as you need to filter for each pass to only affect the given value. You can easily filter for filled diamonds for some notes, and hollow for others. Jari strikes again!